1) The goal is to close the designated numbers 20, 19, 18, 17, 16, 15, and Bull, by scoring at least 3 “marks” on each. 2) Each turn, throw 3 darts. Each dart in one of the designated numbers counts as a mark on that number. Doubles count for 2 marks and triples count for 3 marks. 3) If you have 3 marks on a number and your opponent has less than 3, each additional mark earns you points equal to that number (or 25 for Bull). 4) To win, close all numbers, with at least as many total points as your opponent. 1) Each team starts with a specified number of points (usually either 301, 501, 601, 701, 801, or 1001). The goal is to reach exactly 0 points. 2) Each turn, throw 3 darts. The total value will be subtracted from your score. 3) If your score goes below 0, none of your darts count that turn and your score goes back to what it was at the start of the turn. 4) The first team to reach exactly 0 points wins the game. 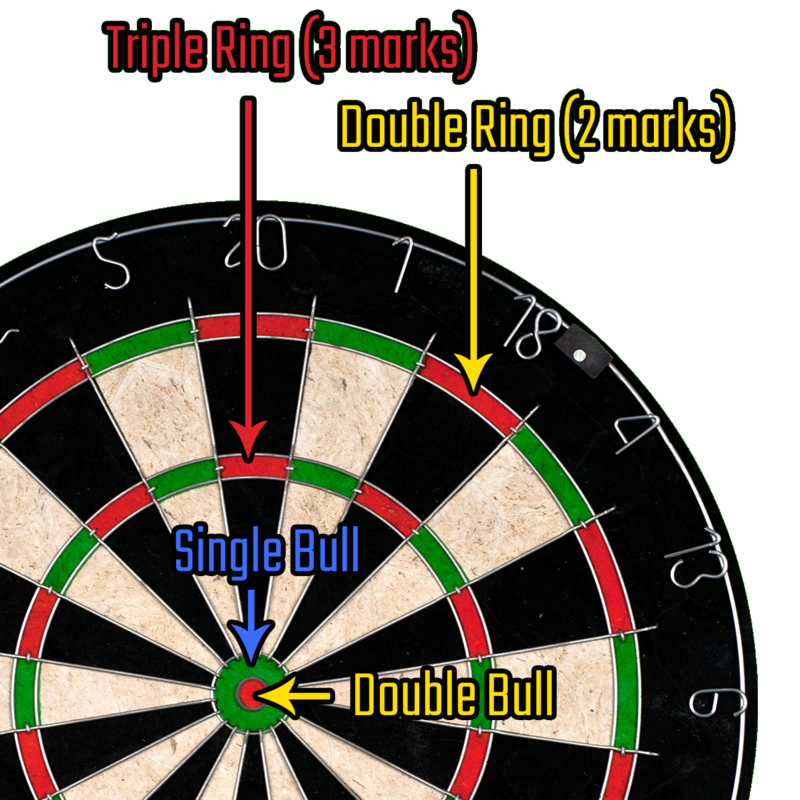 '01 games are often played with the requirement that your last dart lands in the double ring ("double-out"). 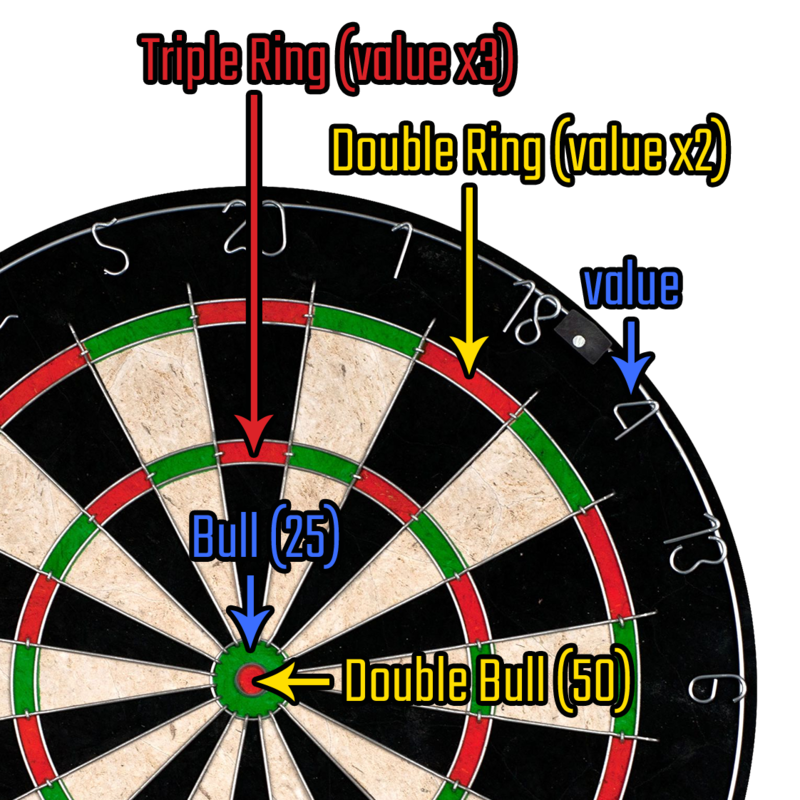 For further increased difficulty, you can require at the start of the game that each team must land a dart in the double ring before they begin scoring points ("double-in").